Evidence-based medicine and research regarding posterior circulation ischemia (PCI) has consistently lagged behind anterior circulation ischemia (ACI) due to presumed diminished prevalence of the disease and surgical inaccessibility. However, posterior circulation infarcts account for roughly one-quarter of all ischemic strokes,1 and they remain a significant cause of patient morbidity and mortality. In this article, we review pertinent vertebrobasilar anatomy, along with background research of posterior circulation atherosclerotic pathology. 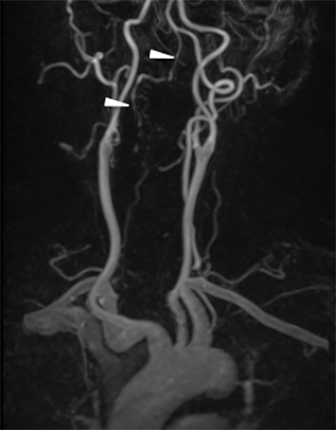 Further, we illustrate case examples of vertebrobasilar disease, highlighting endovascular treatment options. The clinical diagnosis of vertebrobasilar insufficiency (VBI) and PCI is generally more complex than that of ACI, especially for a non-neurologist. Whereas aphasia and weakness associated with ACI is typically obvious, VBI and PCI present with symptomatology that can be somewhat more subtle. Typical findings are vague and may be confused with inner ear disease. Based on the New England Medical Center-Posterior Circulation Registry (NEMC-PCR),2 the most common symptoms include dizziness and syncope (47%), unilateral limb weakness (41%), dysarthria (31%), headache (28%), and nausea or vomiting (27%). The most frequent signs are unilateral limb weakness (38%), gait ataxia (31%), unilateral limb ataxia (30%), dysarthria (28%), and nystagmus (24%). Fewer than 1% of patients with VBI presented with only one complaint, signifying pattern recognition in diagnosis of such patients. In general, a combination of cranial nerve palsies and long tract signs localizes the lesion to the brain stem and should, therefore, trigger a posterior circulation vascular evaluation. For many years, patients with suspected ACI have been interrogated and treated with a vastly different approach than patients with suspected PCI. Although researchers have questioned this double standard in the 1980s and 1990s, it was not until 2004 when Caplan et al drastically changed this paradigm by demonstrating that stroke mechanisms responsible for PCI and ACI were more alike than previously thought.3 In their study of 407 patients from the NEMC-PCR, data collected from 1988 to 1996 demonstrated that cardiogenic emboli (24% vs. 38%) were less common than large artery occlusive disease (32% vs. 9%) in PCI compared to ACI, respectively. The difference in the cardiogenic embolism rate was explained by the fact that the posterior circulation receives approximately one-fifth of the total brain circulation, leading to fewer emboli based on this hemodynamic phenomenon. Thus, by factoring in this inherent hemodynamic disparity, the researchers concluded that the pathophysiology of PCI is indeed very similar to ACI. This landmark trial signified that just like ACI, PCI should also be evaluated thoroughly to select an appropriate therapy based on the causative stroke mechanism. It was generally believed that PCI had low recurrence and mortality rates, making primary and secondary prevention ineffective at a population level. 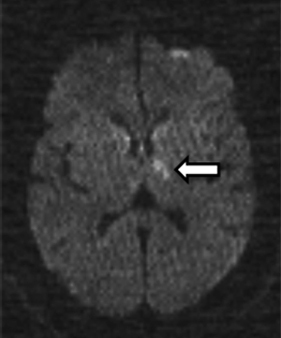 The small recurrence rate was based upon multiple small scaled studies performed in the 1960s and 1970s, which demonstrated recurrence rates of 2%-6%.5 It was not until 1998 that the Warfarin-Aspirin Symptomatic Intracranial Disease (WASID) trial demonstrated a PCI stroke recurrence rate of 22% (15% per year) during a 14-month mean follow-up of 59 symptomatic patients with more than 50% stenosis in the intracranial posterior circulation.6 In 2003, Qureshi et al retrospectively studied 102 patients diagnosed with symptomatic vertebrobasilar stenosis.7 Over a mean follow-up of 15 months, 14% (11% per year) had a recurrent stroke with a total mortality of 21%. In the same year, a meta-analysis of 36 cohorts from 46 articles demonstrated that the recurrence event rate of PCI was not lower than the recurrence rate of ACI; interestingly, it raised the possibility that this rate might be even higher in the first month following a posterior circulation event.5 A prospective study in 2009 supported this theory by showing a 30% recurrence rate for PCI.8 These recurrence rates were significantly higher than previously thought, igniting new interest in this topic. Multiple treatment options have been available for ACI with the mainstay of treatment including carotid endarterectomy (CEA) and anticoagulation for noncardioembolic and cardioembolic strokes, respectively. The single treatment option for PCI was traditionally anticoagulation, since surgical intervention is technically challenging due to difficult access to the posterior circulation. 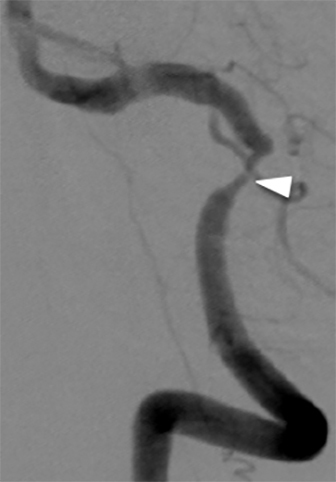 In contrast, the cervical carotid arteries are surgically accessible with the first reported case of CEA published in 1954.9 Anticoagulation therapy for PCI was primarily based on a few uncontrolled retrospective studies performed in the 1950s and 1960s.10,11 While multiple randomized and controlled trials in early the 1990s showed the effectiveness of anticoagulation therapy for recurrent PCI of cardioembolic etiology, there was no clear advantage of warfarin therapy for PCI due to noncardioembolic causes, which led to further clumping of these various stroke mechanisms into one group.12-15 This practice was further validated by a retrospective study in 1995 that demonstrated superiority of warfarin over aspirin, even in PCI due to intracranial stenosis.16 In 2001, however, the Warfarin–Aspirin Recurrent Stroke Study (WARSS), a randomized, double-blind, multicenter clinical trial, showed equal efficacy of these 2 treatments for noncardioembolic PCI.17 In 2005, the WASID investigation also indicated equal efficacy of warfarin vs. aspirin for preventing strokes due to intracranial atherosclerosis.18 Since both ACI and PCI were included in this trial, in 2006, subgroup analysis of the PCI patients was published indicating no significant difference in recurrent stroke rates between the two therapies.19 The trial was terminated prematurely due significantly higher rates of adverse effects in the warfarin-treated arm than the antiplatelet-treated arm. Therefore, empiric anticoagulation therapy not only failed to demonstrate increased efficacy in the setting of noncardiogenic phenomenon, but it also was shown to carry a worse adverse effects profile. The major branches of the vertebrobasilar system can be divided into perforant and circumferential arteries. The posterior inferior cerebellar arteries (PICAs), anterior inferior cerebellar arteries (AICAs) and superior cerebellar arteries (SCAs) are the lateral circumferential arteries. The perforant branches directly supply the brainstem and are typically not seen on imaging due to their small caliber. Medial circumferential arteries fill in the gap between the 2 mentioned territories. 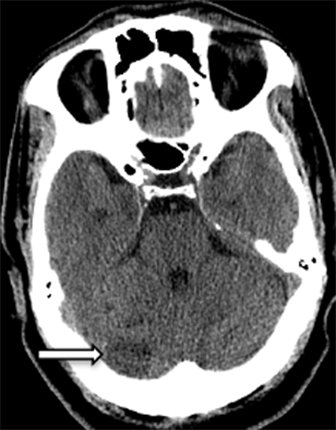 The initial work-up for VBI and PCI typically starts with a nonenhanced CT (NECT), which is an excellent modality for detecting various intracranial pathologies. However, ischemic stroke remains a clinical diagnosis, and NECT should not be used to diagnose such an entity due to a low sensitivity of 31% and 81% at 3 and 5 hours, respectively. The sensitivities are even lower in PCI due to inherent artifact associated with the posterior fossa, primarily due to streak artifact from adjacent osseous structures. The primary goal of NECT is to exclude intracranial hemorrhage and other stroke mimics. Confirmation of ischemic stroke on NECT is a secondary goal, and a normal examination does not exclude ischemia. MRI is superior in detecting ischemia. 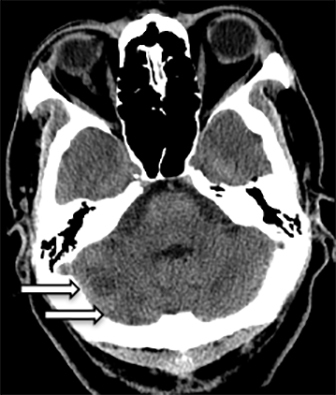 Diffusion-weighted imaging (DWI) has sensitivity of at least 90% and could aid in diagnosis. 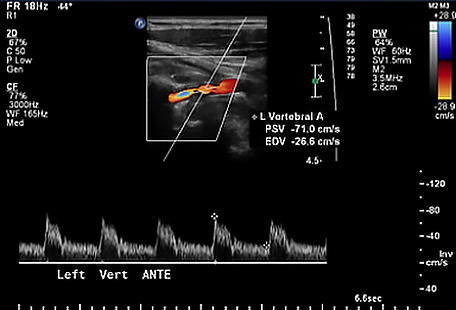 Ultrasound examination is of limited utility in the evaluating the posterior circulation, predominantly due to lack of an acoustic window. Although the most common location of atherosclerosis of VAs is at their origin, only the V2 segments of the VAs are routinely evaluated. Direction of blood flow is easily determined with color Doppler, which is crucial in diagnosis of subclavian steal syndrome. In this syndrome, there is critical stenosis of the subvclavian artery proximal to origin of the VA with reversal of blood flow in the ipsilateral VA perfusing the upper extremity vasculature. In short, the vertebral artery steals blood from the cerebral circulation to supply the upper extremity. Spectral Doppler waveforms only show changes in severe cases of stenosis. A normal VA waveform is a low-resistant arterial waveform. Spectral broadening, high-resistant waveform and elevated peak systolic velocities may indicate stenosis; however, these findings are not sensitive enough, and no criteria resembling carotid stenosis have been established for staging VA stenosis. 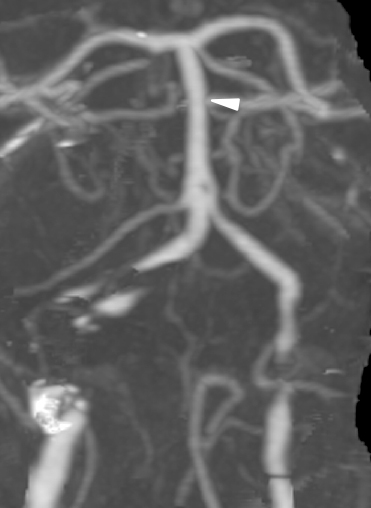 CT angiography (CTA) and MR angiography (MRA) are the 2 most common imaging techniques for evaluating cerebral vasculature. In comparison to CTA, MRA has no ionizing radiation and may be performed without intravenous contrast by using time-of-flight (TOF) sequences. This is especially important in patients with chronic kidney disease where intravenous contrast is problematic. TOF sequences provide excellent images of the circle of Willis. 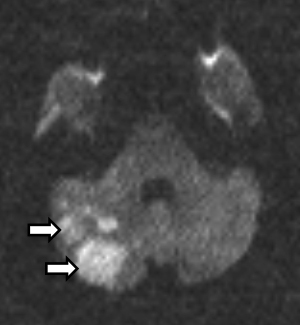 Imaging the cervical carotid and vertebral arteries with this technique is somewhat limited due to a large field of view, and the V1 segments of VAs are typically not seen. 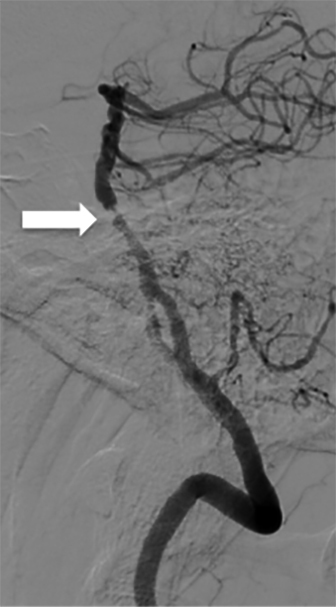 Complete evaluation of the vasculature may be accomplished with CTA or contrast-enhanced MRA. CTA is quick and widely accessible. Ionizing radiation and iodinated contrast are the downsides of this modality. Although CTA and MRA techniques have vastly improved from the early days, artifacts are associated with both of these modalities. 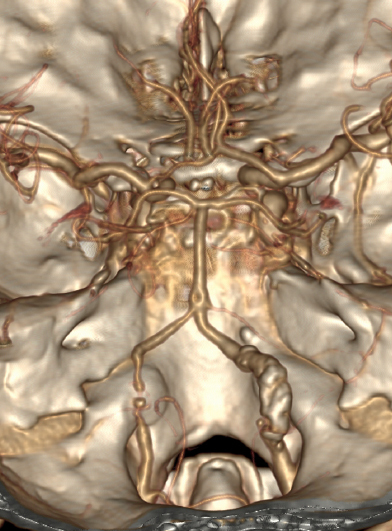 Therefore, catheter angiography remains the gold standard for imaging the cerebral vasculature. 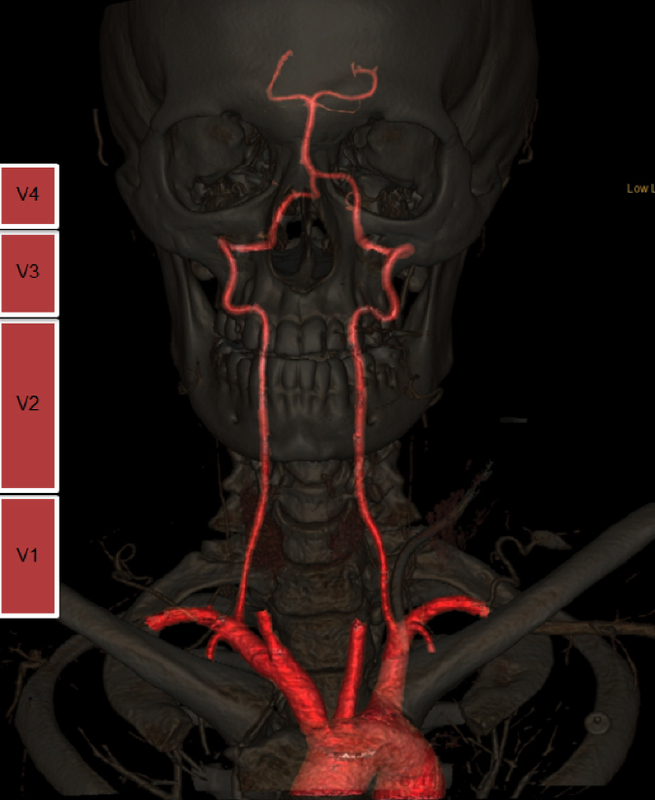 Figure 1 demonstrates all 4 segments of the vertebral arteries and the basilar artery by CTA; postprocessed image demonstrates the underlying bony anatomy of the head and neck. The goal of each imaging modality is to clearly demonstrate each segment of the posterior circulation, separating normal from diseased sections. The clinical use of ultrasound, CTA, and MRA, as well as cerebral angiography are further illustrated in the following cases. 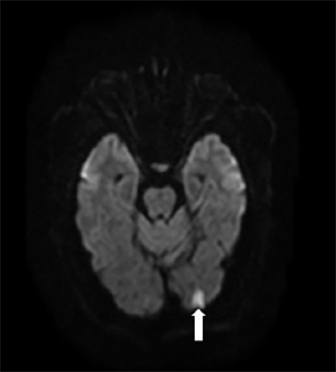 A 67-year-old man with past medical history (PMH) significant for hypertension and chronic kidney disease presented with one month of intermittent vertigo, dizziness, light-headedness, blurry vision, double vision, headache and unsteadiness. 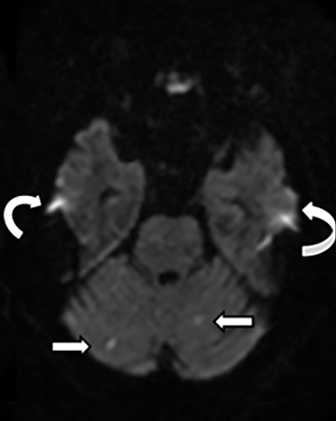 On admission, noncontrast head CT and brain MRI demonstrated subacute infarcts in the bilateral cerebellar hemispheres, a subacute to chronic infarct in the left frontal lobe, and left temporal lobe encephalomalacia (Figure 2). MRA was significant for occlusion of the proximal segment of the right vertebral artery and critical stenosis of the left vertebral artery at the ostium (Figures 3A, 4A, 4B). 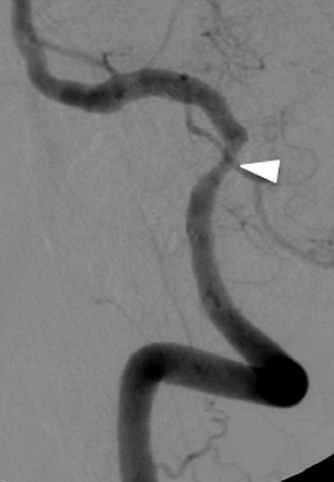 Digital subtraction angiogram (DSA) performed on hospital day 6 demonstrated critical stenosis of the left vertebral artery ostium (Figure 4C). 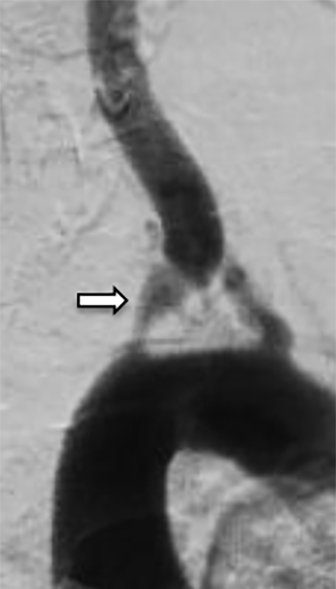 The right vertebral artery was occluded with poor collateral flow to the V4 segment (Figure 3B). The right vertebral artery supplied some flow to the right PICA territory but no flow was seen distally. The patient was started on anticoagulation therapy with aspirin and clopidogrel. 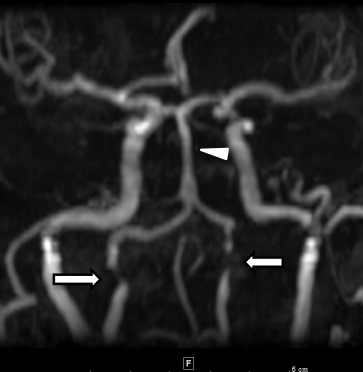 Two days later, on hospital day 8, the left vertebral artery was treated with angioplasty and stented using a 4-x-18-mm bare-metal stent (VISION stent; Abbott Laboratories, Abbott Park, Illinois). 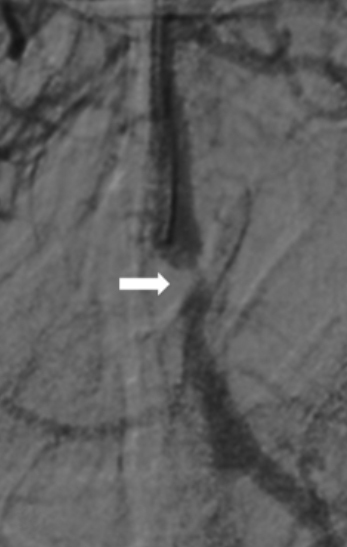 Postintervention angiogram demonstrated no residual stenosis and no significant stent encroachment within the left subclavian artery (Figure 4D). There was excellent runoff to the basilar artery with new retrograde flow within V4 and V3 segments. The postprocedure hospital course was otherwise uneventful and the patient was discharged on aspirin and clopidogrel. He continued to do well postprocedure without posterior circulation insufficiency symptomatology. 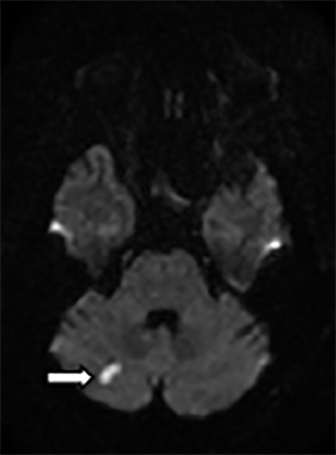 A 57-year-old man with PMH of stroke, hypertension, and dyslipidemia on chronic aspirin therapy presented with 2 days of intermittent difficulty walking, dizziness and right-sided weakness. Neurological examination revealed a fluctuating mental status, right-sided cranial nerve weaknesses, decreased right-sided extremity strength, and an upward Babinski reflex on the right. Initial head CT and brain MRI demonstrated several areas of subacute infarction in the right cerebellum, bilateral pons, left thalamus, and portions of the right occipital lobe (Figures 5, 6). The right vertebral artery was densely calcified on CT and demonstrated abnormal signal on MRI, concerning for occlusion MRA demonstrated occlusion of the right vertebral artery and critical stenosis of the V4 segment of the left vertebral artery (Figure 7A). There was stenosis of the basilar artery, nonvisualization of the PCAs and multiple areas of stenosis in the intracranial ICAs and MCAs. 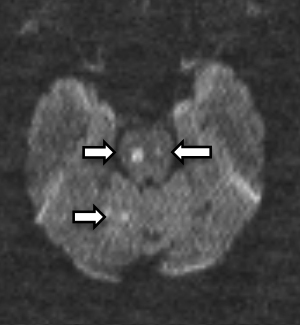 Diagnostic DSA confirmed the areas of stenosis seen on MRA but did show some flow in the right vertebral artery (Figures 7B, C). 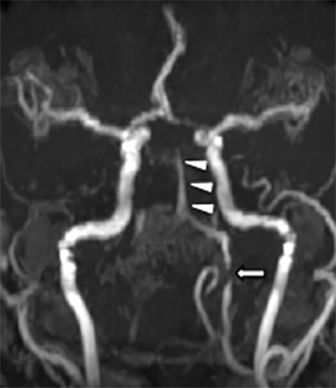 The appearance of the basilar artery on DSA raised concern for thrombosis of the stenotic vessel and treatment with aspirin and clopidigrel was initiated. MRA and CTA performed after 13 days of anticoagulation demonstrated improved flow to the right vertebral artery and basilar artery (Figure 8). There was persistent severe stenosis of the distal intracranial portions of both vertebral arteries and mild stenosis of the mid basilar artery. The next day, stent-supported angioplasty of the mid right vertebral artery stenosis was performed using a 4.5-x-20-mm Gateway balloon-Wingspan stent system (Boston Scientific, Fremont, California). 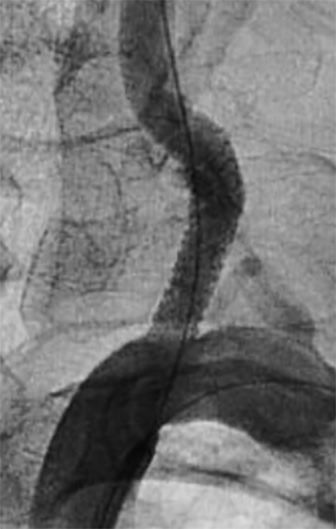 Postprocedure angiography demonstrated approximately 50% residual narrowing at the level of the stenosis with markedly improved luminal diameter and flow (Figure 9). The patient continued to do well clinically, maintained on an anti-platelet regimen. 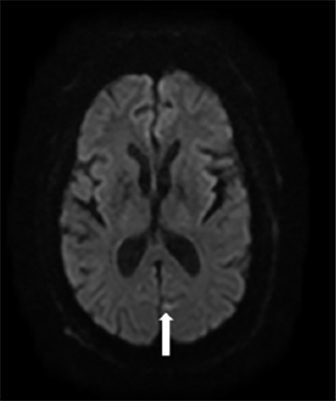 A 58-year-old man with PMH significant for hypertension, diabetes, and hyperlipidemia was admitted for altered mental status. 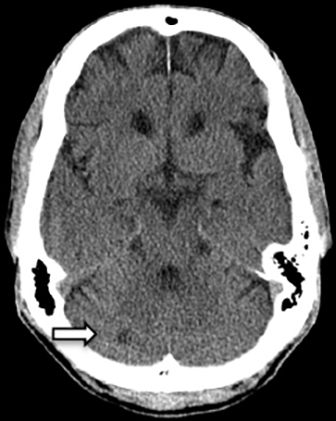 An unenhanced CT (not shown) demonstrated no acute finding. US revealed findings consistent with stenosis of the right vertebral artery (Figure 10). 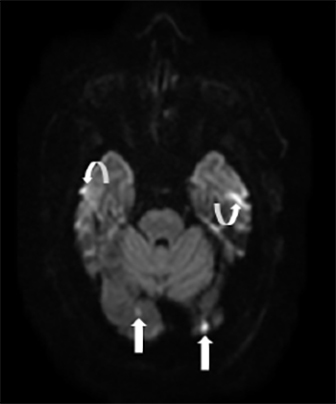 MRI performed the same day revealed multiple areas of restricted diffusion in the occipital lobes, compatible with ischemic strokes of embolic etiology (Figure 11). Old lacunar infarcts in the cerebellum were also evident. 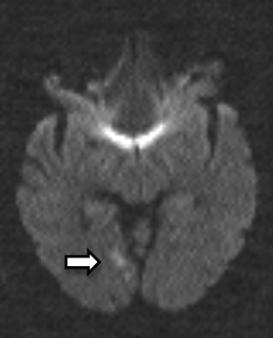 MRA of the brain suggested at least a 70% stenosis of the mid basilar artery, which was upgraded to 90% stenosis upon DSA (Figure 12). 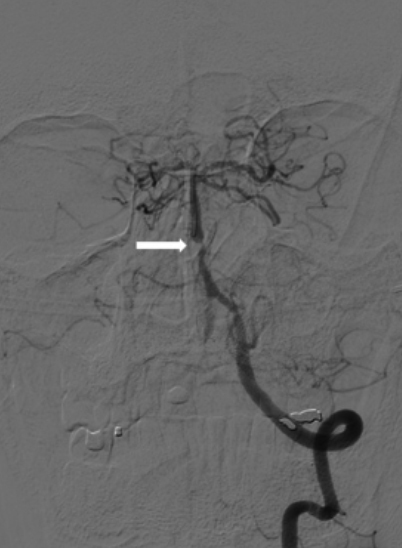 Since the patient had experienced multiple strokes despite aggressive medical management, endovascular management of the mid-basilar artery stenosis was considered. On day 9 of admission, successful angioplasty was performed (Figure 13). Following intervention, the patient remained stable with no additional episodic posterior circulation ischemic episodes or stroke. Primary atherosclerotic disease of the vertebrobasilar system remains a significant subset of ischemic vascular disease and stroke affecting the population-at-large. With increasing clinical awareness, investigators have advanced noninvasive imaging capabilities, which primarily affect the vertebral and/or basilar arteries, and precisely diagnose areas of pathology. Concomitant neurointerventional advances in catheter-based therapies have advanced the treatment options for this often debilitating or deadly disease. Continued research remains paramount in an effort to recognize symptomatology, perform appropriate medical imaging tests, and formulate appropriate treatment plans. Bogousslavsky J, Van Melle G, Regli F. The Lausanne Stroke Registry: analysis of 1,000 consecutive patients with first stroke. Stroke 1988;19(9):1083-1092. Searls DE, Pazdera L, Korbel E, Vysata O, Caplan LR. Symptoms and signs of posterior circulation ischemia in the New England Medical Center Posterior Circulation Registry. Arch Neurol 2012;69(3):346-351. Caplan LR, Wityk RJ, Glass TA, et al. New England Medical Center Posterior Circulation Registry. Ann Neurol 2004;56(3):389-398. 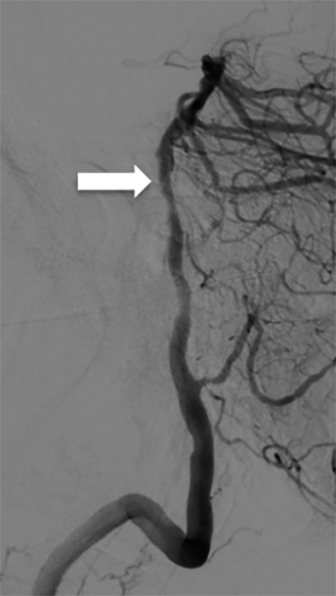 Caplan L. Posterior circulation ischemia: then, now, and tomorrow. The Thomas Willis Lecture-2000. Stroke 2000;31(8):2011-2023. Flossmann E, Rothwell PM. Prognosis of vertebrobasilar transient ischaemic attack and minor stroke. Brain 2003;126(9):1940-1954. 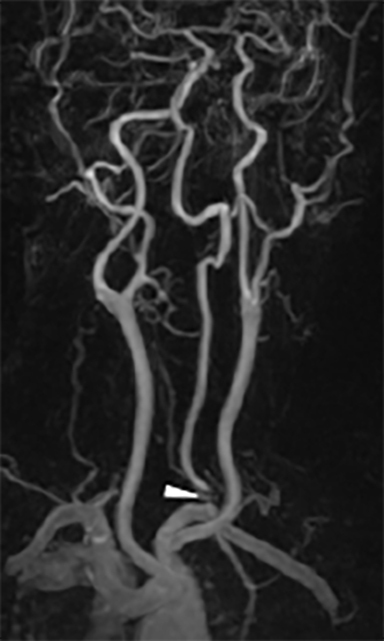 Prognosis of patients with symptomatic vertebral or basilar artery stenosis. The Warfarin-Aspirin Symptomatic Intracranial Disease (WASID) Study Group. Stroke 1998;29(7):1389-1392. Qureshi AI, Ziai WC, Yahia AM, et al. Stroke-free survival and its determinants in patients with symptomatic vertebrobasilar stenosis: a multicenter study. Neurosurg 2003;52(5):1033-1039; discussion 1039-1040. Gulli G, Khan S, Markus HS. 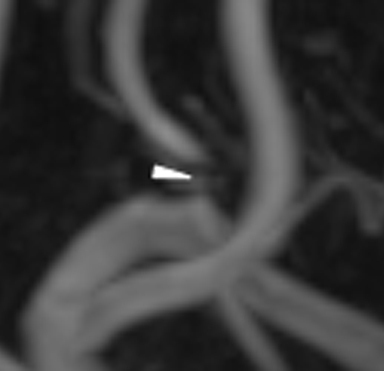 Vertebrobasilar stenosis predicts high early recurrent stroke risk in posterior circulation stroke and TIA. Stroke 2009;40(8):2732-2737. Eastcott HH, Pickering GW, Rob CG. Reconstruction of internal carotid artery in a patient with intermittent attacks of hemiplegia. Lancet 1954;267(6846):994-996. Craven LL. Prevention of coronary and cerebral thrombosis. Miss Valley Med J 1956;78(5):213-215. Millikan CH, Siekert RG, Whisnant JP. Anticoagulant therapy in cerebral vascular disease; current status. J Am Med Assoc 1958;166(6):587-592. A double-blind trial to assess long-term oral anticoagulant therapy in elderly patients after myocardial infarction. Report of the Sixty Plus Reinfarction Study Research Group. Lancet 1980;2(8202):989-994. The effect of low-dose warfarin on the risk of stroke in patients with nonrheumatic atrial fibrillation. The Boston Area Anticoagulation Trial for Atrial Fibrillation Investigators. New Engl J Med 1990;323(22):1505-1511. Ezekowitz MD, Bridgers SL, James KE, et al. Warfarin in the prevention of stroke associated with nonrheumatic atrial fibrillation. Veterans Affairs Stroke Prevention in Nonrheumatic Atrial Fibrillation Investigators. New Engl J Med 1992;327(20):1406-1412. Warfarin versus aspirin for prevention of thromboembolism in atrial fibrillation: Stroke Prevention in Atrial Fibrillation II Study. Lancet 1994;343(8899):687-691. Chimowitz MI, Kokkinos J, Strong J, et al. The Warfarin-Aspirin Symptomatic Intracranial Disease Study. Neurology 1995;45(8):1488-1493. Mohr JP, Thompson JL, Lazar RM, et al. A comparison of warfarin and aspirin for the prevention of recurrent ischemic stroke. New Engl J Med 2001;345(20):1444-1451. Tay KY, JM UK-I, Trivedi RA, et al. Imaging the vertebral artery. Eur Radiol 2005;15(7):1329-1343. Kasner SE, Lynn MJ, Chimowitz MI, et al. Warfarin vs aspirin for symptomatic intracranial stenosis: subgroup analyses from WASID. Neurology 2006;67(7):1275-1278. Marquardt L, Kuker W, Chandratheva A, Geraghty O, Rothwell PM. Incidence and prognosis of > or = 50% symptomatic vertebral or basilar artery stenosis: prospective population-based study. Brain 2009;132(Pt 4):982-988. Coward LJ, McCabe DJ, Ederle J, Featherstone RL, Clifton A, Brown MM. Long-term outcome after angioplasty and stenting for symptomatic vertebral artery stenosis compared with medical treatment in the Carotid And Vertebral Artery Transluminal Angioplasty Study (CAVATAS): a randomized trial. Stroke 2007;38(5):1526-1530. Antoniou GA, Murray D, Georgiadis GS, et al. 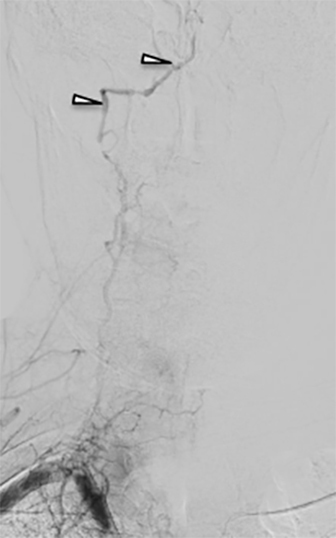 Percutaneous transluminal angioplasty and stenting in patients with proximal vertebral artery stenosis. J Vasc Surg 2012;55(4):1167-1177. Gulli G, Marquardt L, Rothwell PM, Markus HS. Stroke risk after posterior circulation stroke/transient ischemic attack and its relationship to site of vertebrobasilar stenosis: pooled data analysis from prospective studies. Stroke 2013;44(3):598-604. Derdeyn CP, Chimowitz MI, Lynn MJ, et al. Aggressive medical treatment with or without stenting in high-risk patients with intracranial artery stenosis (SAMMPRIS): the final results of a randomised trial. Lancet 2014;383(9914):333-341. Compter A, van der Worp HB, Algra A, Kappelle LJ. Prevalence and prognosis of asymptomatic vertebral artery origin stenosis in patients with clinically manifest arterial disease. Stroke 2011;42(10):2795-2800. Standring S, Gray H, Elsevier S. Gray’s anatomy: the anatomical basis of clinical practice. Edinburgh: Churchill Livingstone/Elsevier; 2008. Cloud GC, Markus HS. 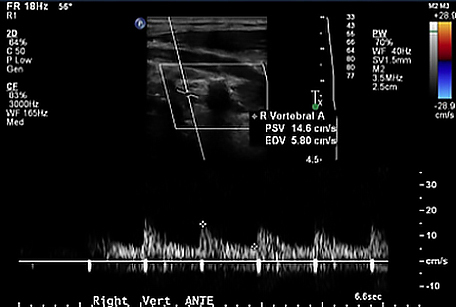 Diagnosis and management of vertebral artery stenosis. QJM-Mon J Assoc Phys 2003;96(1):27-54. Muller M, Schmitz BL, Pauls S, et al. Variations of the aortic arch — a study on the most common branching patterns. Acta Radiologica 2011;52(7):738-742. Koenigsberg RA, Pereira L, Nair B, McCormick D, Schwartzman R. Unusual vertebral artery origins: examples and related pathology. Catheter Cardiovasc Interv 2003;59(2):244-250. Sanelli PC, Sykes JB, Ford AL, Lee JM, Vo KD, Hallam DK. Imaging and treatment of patients with acute stroke: an evidence-based review. Am J Neuro- radiol 2014;35(6):1045-1051. Namini A, Naylor M, Koenigsberg RA. 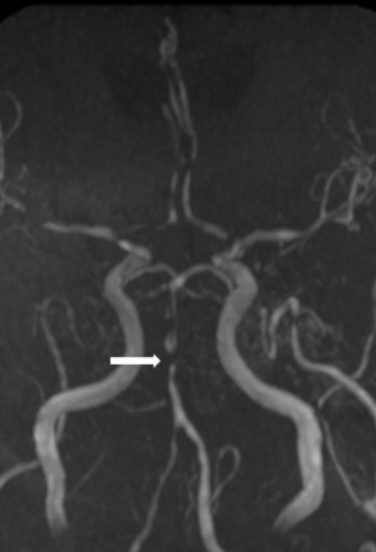 Vertebrobasilar Insufficiency and Stroke — A Review of Posterior Circulation Diagnostic Imaging and Endovascular Treatment Optio. J Am Osteopath Coll Radiol. 2015;4(3):15-23.